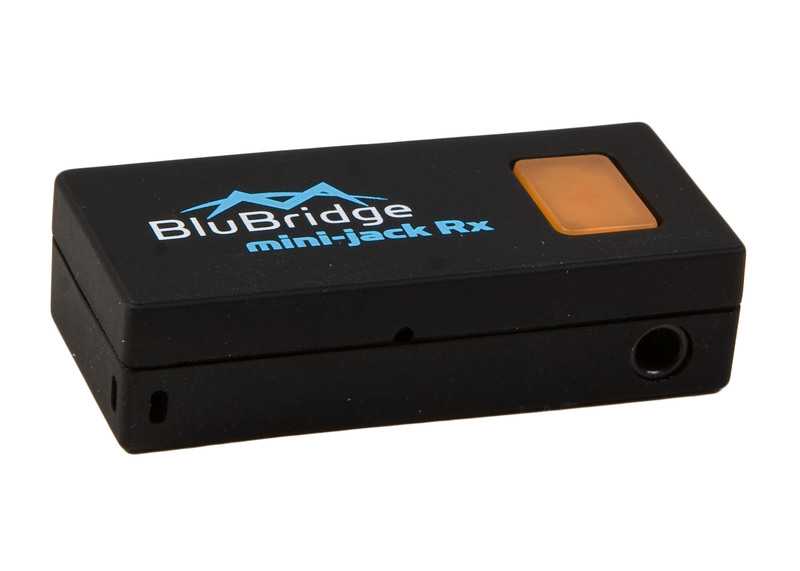 If you don’t like running a cable from your phone to your car, and your vehicle can’t talk ‘A2DP,’ it’s time to buy a Bluetooth receiver that can! You may have heard I bought a Toyota RAV4 last month. Like any new relationship with tech, I was dazzled by all the sparkle. “And you can make Bluetooth-enabled hands-free calls from your smartphone with the car’s voice-recognition technology using the overhead microphone and stereo speakers? But the next morning, you invariably wake up, take another look and realize when it comes to tech, perfection is always just out of reach. “You can’t stream music from a smartphone to the car’s speakers via Bluetooth?! And while car body styles don’t change much from year to year, the embedded tech you don’t see ages swiftly in dog years. So to play my iPhone’s music through my car’s stereo system, I discovered I needed to jack in my iPhone to an AUX input port next to the shift lever, using a bright green mini cable (3.5 mm) I had lying about. Now, who wants to hard-wire your phone every time you want some tunes? So what’s a humanoid to do? Get thee to a computer and research a Bluetooth receiver workaround to replace this messy, old school cabling solution! Like my RAV4, lots of newer cars come equipped with Bluetooth power to make smartphone calls via the car’s stereo system. But to stream music via Bluetooth from the same smartphone, a car also needs to be ‘A2DP’ capable. A2DP is simply a newer Bluetooth flavor. So if your car can’t do A2DP, what you need is a portable A2DP Bluetooth receiver to pair with your smartphone and then send the A2DP audio down the car’s AUX jack with its own cable. In fact, Bluetooth tech allows you to connect up to 8 devices simultaneously. Just don’t try to do exactly the same thing with any two of the connections. You might expect a wide range of available solutions to address all three pieces. But in fact, there are not! The challenge is finding a compact unit with a DC adapter that’s priced right. What’s not to like? The form factor is perfect! 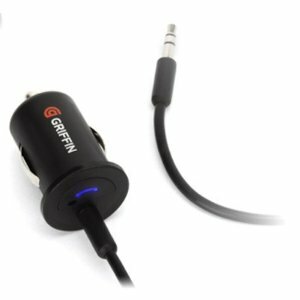 It’s tiny and does the job of bridging the inches between your iPhone and the AUX jack. The problem is it only runs on its rechargeable battery. So you’ve always got to worry about charging it up via a USB port. This one doesn’t have the short cable. Its little plug juts right out of the unit. Then, the tiny stick attaches onto the AUX jack. 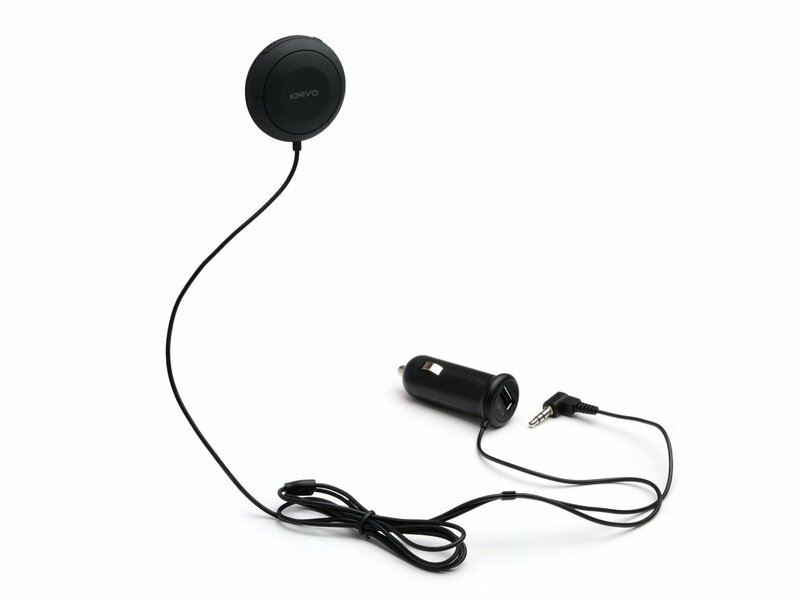 This device can also handle your phone calls, because it houses a microphone in its little disc controller. But you don’t have to use it for that purpose, since you’ve already got your car’s phone system paired to your phone for that use. The unit gets really great reviews on Amazon. It even auto-connects, when it senses your phone! The only problem is you’ve got two cables to contend with. Granted, neither of them weighs down your phone. It’s more expensive, but for no apparent reason. This should be the perfect choice! 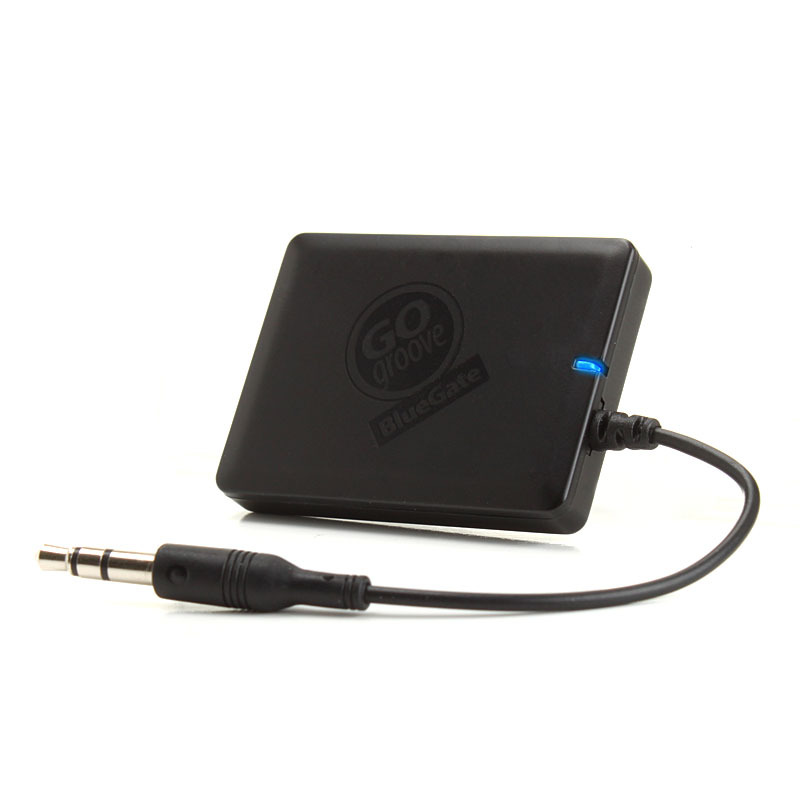 (which houses the Bluetooth receiver) straight to your AUX jack. The only problem is price. It shouldn’t be this expensive! I think the root cause is it’s been discontinued. Now, it’s only offered on Amazon Prime through a third party. What I mean is… today’s ‘new’ cars can normally handle A2DP audio streaming if they’ve got Bluetooth functionality. They don’t need no stinking adapters! So this is yesterday’s problem. Manufacturers know this and probably haven’t continued to offer more efficient solutions, simply because there’s no future in supporting this particular past. So what’s a cable-phobic tech everyman to do? 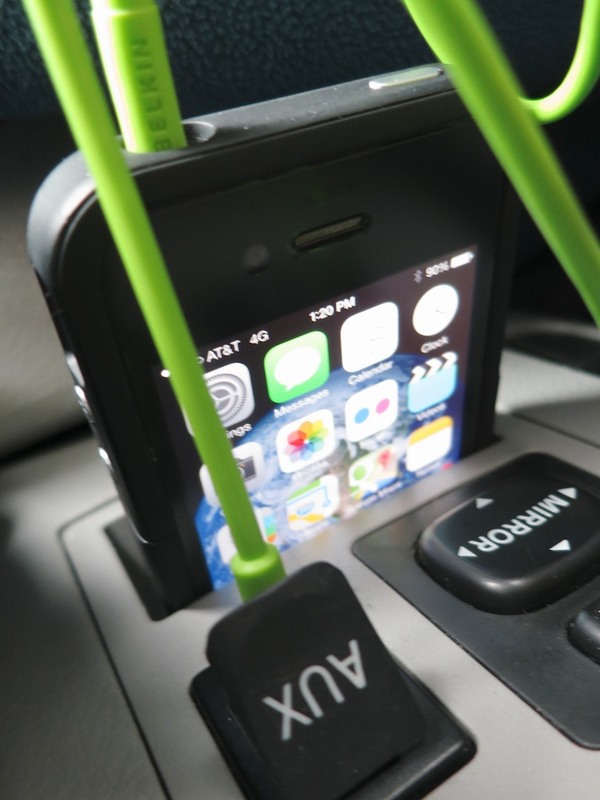 Honestly, I considered doing nothing and just leave that bright green mini cable in my car for my iPhone’s use. The phone slips nicely into a little slot right above the AUX jack. But that solution wouldn’t be very forward focused, would it? And hardly a fitting end to this week’s epic journey in search of tech enlightenment. So I Iooked again at the Kinivo and its 963 ratings boasting four and five stars. If adding two cables to lose one cable is what it takes to free up my iPhone from its lowly 20th century tether, then I say…. Did I mention how much I love my car? Your article article is very interesting bit in the case of mt rav4 III life from 2008 i have a simple auto radio (toyota 58827) which has no AUX jack. How to do in this situation?